It's just not the same without a keyboard. Google and a wide variety of hardware makers tried for years to get Android tablets to catch on, but they were never able to match the success Apple found with the iPad. At the same time, though, Google's Chrome OS was gaining new features and finding traction with both individuals and in the education market. The latter has been particularly important -- and with Apple and Microsoft both pushing tablets for education, Google has decided it's time for Chrome OS to arrive on tablets as well. Enter Acer's awkwardly named Chromebook Tab 10, the first tablet to run Chrome OS. It costs $330 and is focused squarely on the education market. Acer built the device specifically for classrooms; the company has stressed that this isn't a tablet meant for the average consumer. As such, this device doesn't come close to matching the fit and finish you'll find on an iPad or Microsoft's new Surface Go. Still, it's the only Chrome tablet out there, so it's the only way right now to see if Google's OS works as well on a keyboard-less machine as it does on a laptop. 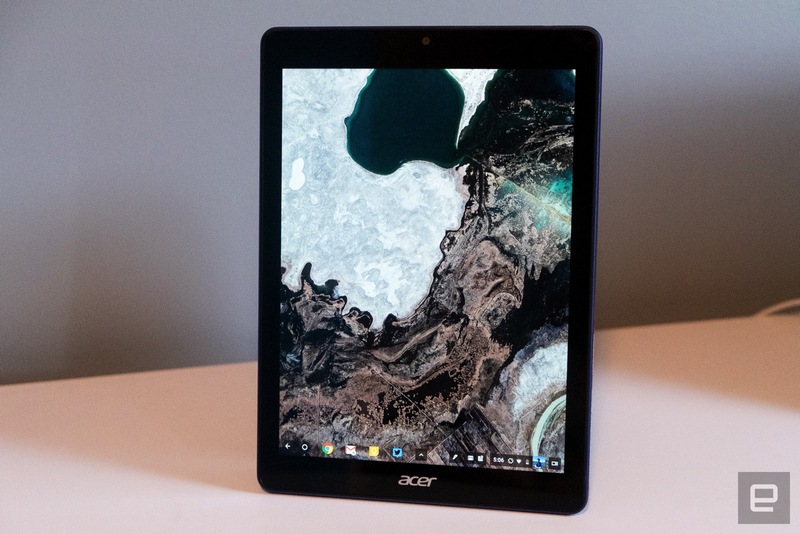 Acer's first Chrome OS tablet is hard to recommend, even for its intended education audience. A Chromebook with a proper keyboard would be far more useful, as Chrome OS hasn't been optimized for tablets yet. Meanwhile, if you really want a tablet, there's no reason to recommend this over an iPad, which costs the same. Be the first to review the Chromebook Tab 10? Booting up the Chromebook Tab 10 feels familiar. There's a quick setup process that involves getting the tablet on a WiFi network and signing in with a Google account. Since I've used other Chromebooks, the Tab 10 pulled in all the apps I've pinned to my shelf and downloaded everything I had installed from the Google Play Store. This all happened pretty quickly, and within minutes I was up and running. 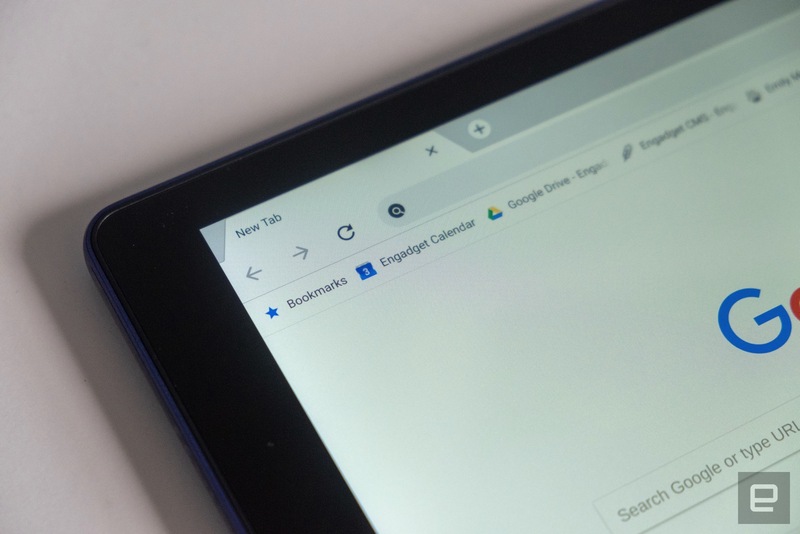 At first glance, the Chrome OS UI for tablets is essentially identical to what you'll see on any other Chromebook, with a few noticeable changes. Perhaps the biggest is that on a tablet, the OS defaults to showing every app in full-screen mode. On a device like the Tab 10 (which has a 9.7-inch screen), this makes sense, but I would have appreciated the option to view apps in the standard, windowed mode for better multitasking. In fact, there is a multitasking button in the lower right corner of the screen that pulls up every app the Tab 10 is running. That makes switching between apps pretty quick. And while Chrome OS doesn't let you run many apps in Windows like you can on a laptop, it does support a split-screen mode. Google added this to convertible Chromebooks awhile back, and it makes sense to have it here as well. From the multitasking interface, you can drag an app to the left or right side of the screen to pin it there; the remaining open apps will show up on the other side of the display so you can pick what you want on the other side of the screen. But those two apps are the max that Chrome OS lets you work with at one time. It feels weird to dedicate a whole section of this review to the Chrome browser, but it's perhaps the one big trump card Google has. The iPad uses a mobile version of Safari, which has improved significantly over the years and mostly feels identical to the browser on a Mac. But the Chrome browser on the Tab 10 is the best browser on a tablet I've used, because it's exactly the same experience as using Chrome on Windows or a Mac. Web pages never try to load the mobile version, just about everything rendered as I expected and all of my Chrome extensions were installed and ready to go. As with multitasking, the smaller screen (and limited hardware of this particular device) meant that I didn't open as many tabs here as I would on a laptop, but that's the same way I use my iPad. 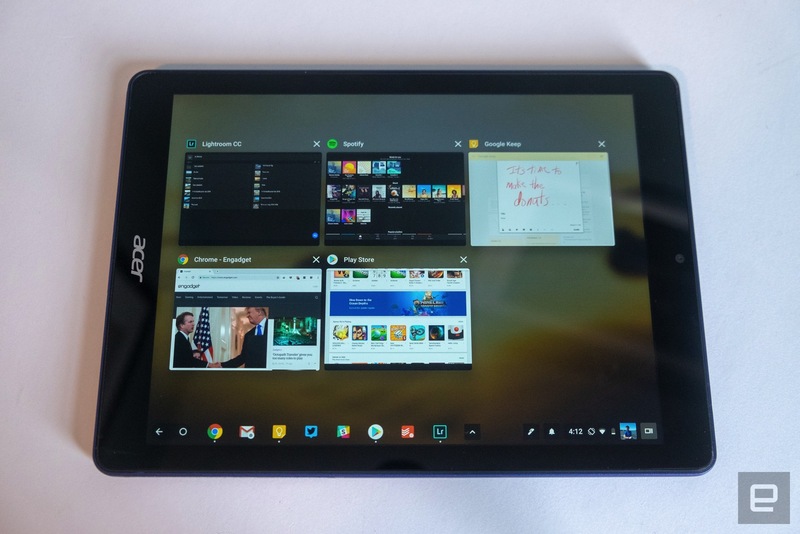 Given that huge chunks of my tablet time are made of of web browsing, I'd definitely be interested in trying a Chrome OS tablet with more-powerful hardware than what Acer put into the Tab 10. Like most recent Chrome devices, the Tab 10 has access to the Google Play Store. This means it can run most Android apps and games you can find, though there are some that show up as incompatible with the Tab 10 and other Chrome OS computers. But for the most part, everything I looked for was available -- that includes all of Google's apps. I installed Gmail, Drive, Docs, Sheets, Maps, Calendar, Photos, Play Movies, Play Music, YouTube and YouTube Music, as well as plenty of third-party apps. Among the ones I tried were Adobe Lightroom CC, PS Vue, Todoist, Sonos, Pocket, Spotify, Squid, Twitter and Hulu, plus a smattering of games. For the most part, these apps all worked fine. But for better or worse, the experience basically felt like using an Android tablet did a few years ago. 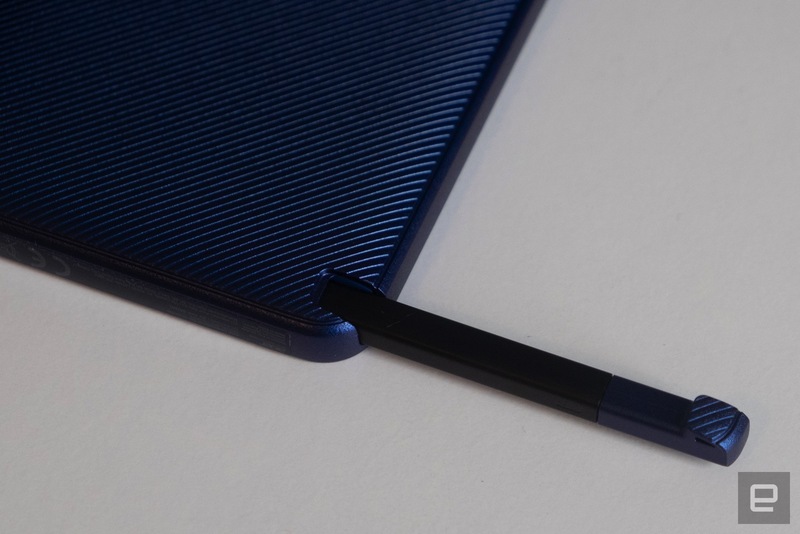 (The intriguing but flawed Pixel C is the last one I used extensively.) Few apps feel truly optimized for the larger screen, and they're generally lower quality than their iOS counterparts. 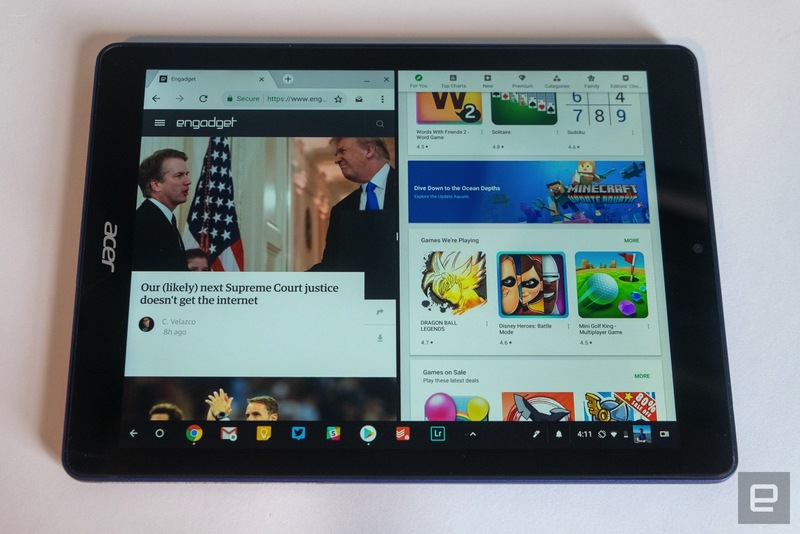 And because Chrome OS' tablet mode forces apps into full screen, you can't take advantage of the nice mix of Chrome windows and small, phone-sized Android apps like you can when using a laptop. Having a small view of my calendar or to-do list on the side of my screen is handy, but that won't work here. 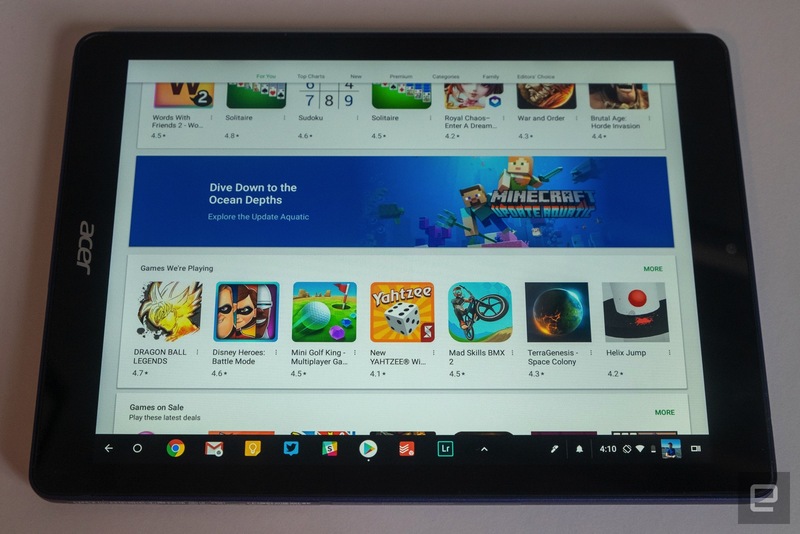 Still, despite these caveats, having access to apps from Google Play makes the Chrome a viable tablet OS, particularly for the education market the Tab 10 is targeting. But compared to the vast wealth of excellent iPad apps available, there's no doubt that Apple's option will give you a higher-quality experience. 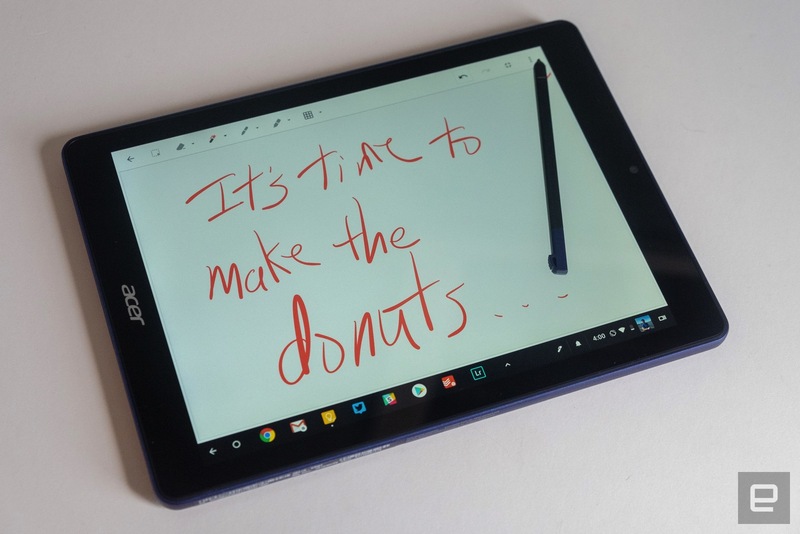 While I'm not interested in putting the Chromebook Tab 10 through the typical rigors of our review process, it's worth discussing what the first education-focused Chrome tablet brings to the table. It features a 9.7-inch screen with average-sized bezels around it, along with a plastic back (a good choice rather than fragile aluminum for a classroom-focused device). It feels like a chunky iPad, which isn't a bad thing. It won't win any design awards, but it gets the job done. The screen is probably the most important part of a tablet, and fortunately the Tab 10 has a nice one. It has the same 2,048 x 1,536 resolution as the iPad, and it's bright and sharp to boot. Viewing angles aren't outstanding, but they're good enough for this class of device. The battery is also strong, coming close to Acer's nine-hour estimate. I don't usually use a tablet straight for that long, instead picking it up and using it for an hour here, an hour there throughout the day. In this use case, the Acer lasted several days before needing a charge. There's also a tiny Wacom stylus included; it can be stowed in a slot on the side of the tablet so you don't lose it. It's fine for taking notes and doodling little sketches, but the performance isn't great. There's noticeable lag, making it a poor choice for precision work. But for its intended audience, it'll probably be fine. But performance across the board was a pretty big letdown. The Rockchip processor inside just couldn't do much more than run one or two apps (or windows) at a time before things got stuttery. Playing a game (Alto's Adventure, in my case) worked fine as long as there wasn't much else running. But browsing and multitasking could get dicey with too many apps open, and a few times I crashed the entire OS just trying to launch a new app. The included 4GB of RAM should have been enough, but the 2GHz Rockchip was ultimately not up to the task. Also, the cameras are pure garbage. They shoot images that come out at 1,280 x 960 resolution, less than phone cameras from 10 years ago. Of course, this tablet isn't intended for consumers, and they'll probably let kids experiment with some AR apps. But it's somewhat incredible that Acer was able to even find cameras this poor. Ultimately, it's hard to recommend Chrome OS for tablets in a general sense and the Chromebook Tab 10 specifically. 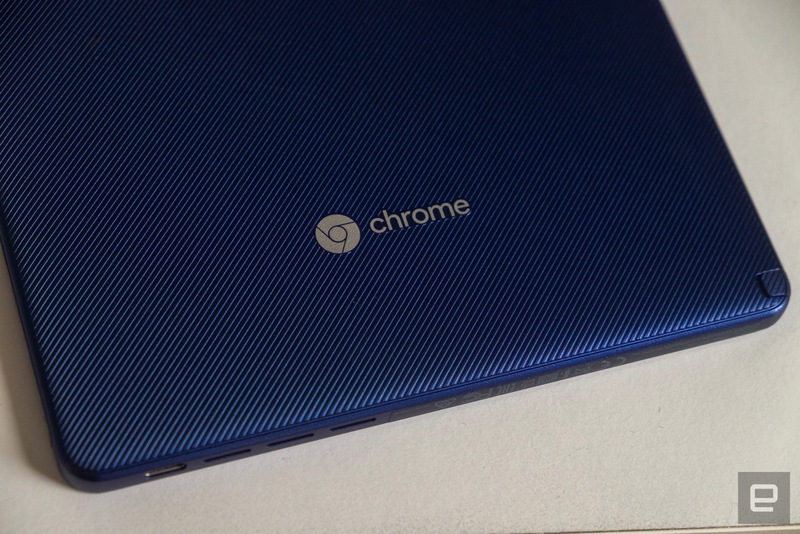 If you want a Chrome device, you're much better suited picking up a traditional laptop. Many Chromebooks have touchscreens and can be converted to tablet mode, but they also have the all-important keyboard and trackpad. It's still an OS designed first and foremost with a traditional computing interface -- the touchscreen elements remain a secondary option, not something you'd want to drive the entire experience. And while the Tab 10 is fine for its intended audience, the price is perplexing. For $330, you can get an underpowered Tab 10 with ill-fitting software ... or a brand-new iPad, with hundreds of thousands of optimized apps. I know what I'd pick.